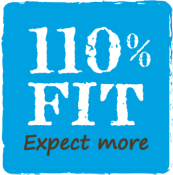 Uniquely, 110 FIT utilizes a Virtual Trainer that will give you a customized, holistic approach and view to your fitness program. With it, everything is trackable via your computer and/or smart phone - body stats, cardio, weights/reps. Customized workouts are spelled out for you day-by-day (even with video examples) so there is absolutely no guess work. Virtual Trainer is NOT a cut & paste p﻿rogram. Programs are designed specifically for you, to your ability level and to the equipment you have available. Each and every program is different. You are held accountable to your workouts via 3 methods in concert -- trainer app/workout program, 110FIT Trainer and your heart rate monitor.